Spain forms the largest state in what is generally the sun-drenched south-western peninsula of Europe. Today it is neighboured to the west by Portugal, to the north by the principality of Andorra, and to the south by the British 'Crown Colony of Gibraltar'. The peninsula has experienced a colourful history that is filled with conquest and re-conquest, and centuries of struggle. Largely external sources recorded conflict between various prehistoric tribes (Iberians, Celtiberians, and others), Classical empires (Carthage and Rome), barbarian invaders (Suevi, Vandals, Visigoths, and Alani - who seem to have given their name to the Spanish province of Catalonia, which is a deformation of Goth-Alania, the province of the Goths and Alani), and then the drawn-out struggle for superiority between Christianity and Islam. Once strong kingdoms had emerged - medieval Portugal and Spain - these became major players in European politics prior to invasion by the French (under Napoleon) and British interaction from 1704 onwards. All of these have left their mark on Iberia in one form or another, not to mention the modern phenomenon of package holidays and ex-pats. It is a history during which there has been terrible loss in so many ways and one that can be evoked through music; in Spain by way of the flamenco which is not confined to dance (baile) but also song (cante) and toque (guitar), and in Portugal by way of fado from the Portuguese word for fate. Spain's history as a unified state began with the amalgamation of several kingdoms in the fifteenth century, but it was the accession of Charles I that really solidified the new state. Spain had effectively been reunited under Ferdinand II of Aragon for the first time since the end of the Visigoth kingdom, This reunification became even more confirmed following the death of his wife, Isabella, the queen regnant of Castile. However, it was under the Habsburg Charles I, the young son of Joanna of Castile and Ferdinand's grandson, that it clearly and irrevocably became a single, united kingdom of Spain. Castile, Navarre and Aragon (as well as Sicily) were permanently joined upon his accession. With Charles came the infant imperial territories in the Americas which were initially governed from Hispaniola. With Charles also came dominion over the Holy Roman empire in 1519 and extensive territories in western, eastern and southern Europe. He became one of the most powerful men in the world, and Spain reached the zenith of its influence and power. It was considered to be continuous with the previously established regional kingdoms of Aragon, Castile, Leon, and Navarre, and the even more ancient Asturias & Galicia, and so the numbering of kings was continued from all of them. At this time, Sardinia was also firmly a Spanish possession. Became Holy Roman Emperor Charles V in 1519. Died 1558. Upon uniting the Spanish kingdoms into one entity, Charles grants the lordship of Les Valls (The Valleys), as it is currently known (Andorra), to Germaine of Foix's line in perpetuity. Following Cortes' landing in Hispaniola in the Americas in 1519, Spain's annexation and occupation of native states creates the beginnings of a vast empire which they initially rule from the viceroyalty of New Spain. To avoid the risk of an adventurous conquistador forming his own breakaway kingdom in the conquered territories, Charles creates the Council of the Indies in 1524. Papal Rome is sacked by an Imperial / Spanish army in 1527, and in the New World, Charles forms the beginnings of the captaincy general of Guatemala to manage territories captured to the south of New Spain. Reforms to the administration follow in 1542 with the creation of a new viceroyalty to govern the captured Inca territories of Peru in South America. The military ventures of Charles against the Hafsids of Ifriqiyya and the Zayyanids of western Algiers (1535 and 1541 respectively) are failures. Subsequently, he is forced to defend Spanish territories in the Mediterranean from raids by the piratical Barbary Corsairs. Part of this effort means that the Sardinian coast is fortified with a chain of defensive lookout towers. Despite the support of the Ottoman sultan for Khayr al-Din Barbarossa and his exploits in securing Algiers, it is only now that his son, Hasan Pasha, becomes the first official governor of the regency to be appointed by Constantinople. Algiers is now the main base for the ongoing Ottoman war against Spain in the Mediterranean and for operations against Morocco. Upon the death of Charles I, his vast single dominion is divided between his son and his brother. His son, Philip, gains the throne of Spain, and the holdings in the Netherlands, while his younger brother, Ferdinand, receives Austria, Bohemia, and Hungary. Younger members of the royal house are also confirmed as dukes of Carinthia and counts of Tyrol, both following Ferdinand's death in 1564. Son. Philip I of Portugal. Count of Netherlands. Duke of Milan. The Spanish launch their expedition against Algiers in an attempt to recapture the city of Mostaganem, the port which they had first taken from the Zayyanids in 1506 but which had been lost to Algiers in 1516. After massing at Oran, the Spanish begin their assault on Mostaganem only to be repulsed. 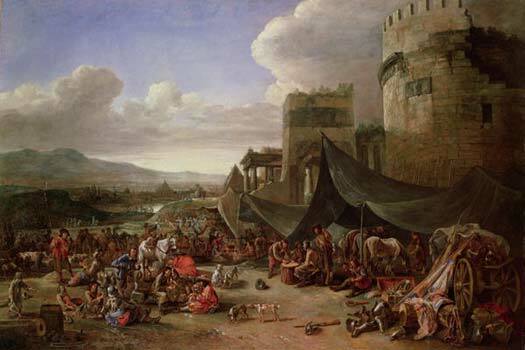 Then they hear that Hasan Pasha is returning from his Moroccan expedition and are panicked into retreating. The defeat ends attempts to form a grand alliance between Spain and Morocco against the Ottomans. A great naval victory at Lepanto is gained when Venice, the Pope and Spain defeat the Ottoman Turks. Spain and Portugal are united under the Iberian Union, although the crowns of both countries are kept separate. The War of the Portuguese Succession is fought between Anthony of Portugal and Philip, but the former claimant is pushed out of the country in 1581. In the same year, the Spanish Habsburgs are thrown out of the Netherlands, with the country being officially declared a republic. As the widower of Mary Tudor, Philip still regards himself as the king of England, even though it had been made clear to him upon his marriage that he would inherit no such right. After years of plots to remove the Protestant Elizabeth Tudor from the English throne, Spain is the instigator of the Anglo-Spanish War after the Catholic Mary Queen of Scots is executed by the English. The year 1588 sees the Spanish Armada defeated in the Channel, but the war ends in a stalemate when Philip dies, and is only formally concluded in 1604. Philip II of Portugal 1598-1621. The Spanish Netherlands is exhausted by war with the Calvinist northerners who are fighting to free the country of Spanish control. A truce is agreed which all but recognises the legality of the independence of the northern Netherlands (Philip's son, Cardinal-Infante Ferdinand, becomes governor of the Spanish Netherlands in 1634). Philip III of Portugal 1621-1640. Became king aged 16. Spanish-controlled Portugal regains its independence in 1640 by offering the crown to John of Braganza. 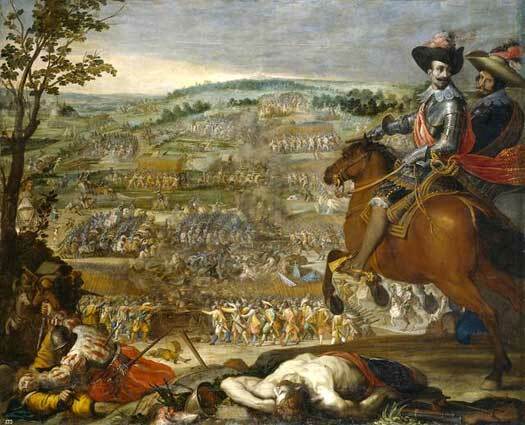 Catalonia revolts in 1640-1659, and defeat at Rocroi by France ends Spanish hegemony. English troops take Jamaica from Spain, making it a hub for rum production and slave trading. The only surviving son of Philip IV, Charles is the product of generations of Habsburg inbreeding, leaving him physically disabled, mentally retarded, and disfigured. He produces no offspring, quite possibly being infertile, and the only surprise during his reign is that he manages to live so long, while frequently being on the verge of death. His successor is named as Philip, duke of Anjou, who ascends the throne as the Bourbon Philip V.
The Treaty of Ryswick draws to a close the Nine Years' War, otherwise known as the War of the League of Augsberg. It stipulates that Spain must formally cede the western third of Hispaniola to France, while Lorraine is handed back to its rightful rulers, ending over half a century of French occupation there. The House of Bourbon dates back to the thirteenth century in France. The Spanish Bourbons were descended from the Marche-Vendôme line (or Bourbon-Vendôme), which gained power when Antoine de Bourbon (died 1562) was given the duchy of Bourbon. Philip V was the third grandson of Louis XIV, and the twentieth century's King Juan Carlos was a direct descendant of his. The Spanish Bourbons spawned several lines, including Bourbon-Parma, descended from Philip, younger son of Philip V, who was duke of Parma, although they were dispossessed of Parma in 1860 when Italy was reunited. The Sicilian Bourbons descended from Ferdinand, second son of Charles III of Spain, king of the Two Sicilies, but they too were dispossessed in 1860. However, the Bourbon acquisition of Spain was hotly disputed by rival powers. The resultant War of Succession lasted for thirteen years and involved many of the ruling heads of Europe. Along the way, in 1714, Barcelona was defeated, with Catalonian institutions and civil rights soon being abolished. The Catalonians know this day as their 'National Day', celebrating it with pro-Catalonian independence rallies and calls for renewed independence from Spain. The day took on an extra dimension in 2017 when a referendum on independence was called earlier in the summer. The Spanish government ruled it illegal but it seemed likely to go ahead anyway. Duke of Anjou in France. Abdicated in 1724. Philip is unhappy with the arrangements set at the end of the War of Succession and occupies Sardinia and Sicily, triggering the War of the Quadruple Alliance. The war begins with Philip's first actions of 1717, and is formally declared in 1718. Austria, Britain, France, and Holland unite to defeat Spain, and peace is again declared with the Treaty of The Hague which is signed in 1720. As part of this treaty, the duchy of Savoy trades Sicily for Sardinia, and the duke is promoted, with Savoy being merged with Sardinia to form a single kingdom of Sardinia. On a better note for Spain, in 1717 the viceroyalty of New Granada is created from Peru's northern territories as Spain's New World territories continue to deliver vast amounts of gold and trade. Son. Died after seven months on the throne. Philip V abdicates his throne in favour of Louis, his eldest son, on 14 January. He doesn't make his reasons clear, but elements of mental instability had already appeared in him during his reign, so perhaps this scares him enough to persuade him to hand over the kingdom. Unfortunately, just seven months later, Louis dies of smallpox and Philip is forced to resume his role as king. The Polish War of Succession (1733-1735) erupts in which Stanislas Lesczynski is supported by his son-in-law, Louis XV of France and Philip V, increasing the Bourbon hold on Europe. Further family gains are made during the War of Jenkins' Ear (1739) and the subsequent War of the Austrian Succession (1740-1748) in which the accession of Maria Theresa to the Austrian archduchy and the title of Holy Roman Emperor is contested. Under Philip's second spell on the throne the country begins to emerge from the period of stagnation which was engendered during the last days of Habsburg rule in the country. Again as part of a wider war, this time the War of the Austrian Succession, Spanish troops seize Milan under the command of Captain General Jean Thierry du Mont, count of Gages. Austrian forces rally, and retake the duchy on 18 March 1746. 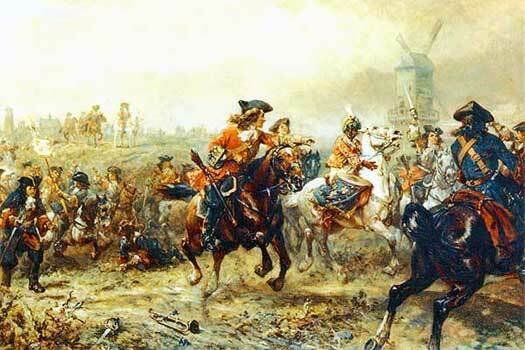 Furthermore, they defeat the Spanish at Piacenza on 16 June 1746 and Tidone on 10 August 1746. The new king, Ferdinand, witnesses the end of the war, which produces no benefit for Spain itself, despite benefiting the Bourbon family in Europe. Determined to help his country catch up with France and Britain, he attempts to promote reform and modernises the navy. Son of Philip V. Former king of the Two Sicilies. The 1750 Treaty of Madrid between Portugal and Spain legitimises the established borders of the colonial territories in Peru and Brazil. In 1759, Charles III abdicates the kingdom of the Two Sicilies to his son, Ferdinand. At the end of the Seven Years' War, under the terms of the secret Treaty of Fontainebleau of 1762, France cedes the vast and wild Louisiana Territory from the French Colonies to Spain. As part of the subsequent Treaty of Paris of 1763, Spain itself loses the colony of Florida to the British but are happy to do so as they have already been handsomely compensated with Louisiana. The British have been confirmed as possessors of Canada following their victory at the Battle of Signal Hill in 1762. The French regain Louisiana in 1800 under the Treaty of San Iidefonso. Manoeuvred into abdicating by the French First Empire. After becoming a member of the First Coalition against revolutionary France, Spain withdraws from the war once it sees which way the wind is blowing, with France seemingly unstoppable on the battlefield. As part of a separate peace deal that Spain agrees with France - the Treaty of Basel - the country is forced to cede the entire island of Hispaniola. Napoleon Bonaparte, emperor of France, is powerless to prevent the naval Battle of Trafalgar, which proves Britain's supremacy at sea, pounding the French and their Spanish allies in a crushing defeat. Napoleon Bonaparte's French First Empire occupies Portugal. The following year he sends armies to occupy Spain. Charles IV decides to flee to New Spain, but the populace are not very receptive to being left leaderless so he is forced to abdicate in favour of his son. Ferdinand VII is almost immediately imprisoned for the duration of the war by Napoleon, who places his own brother on the throne. Son. Imprisoned by Napoleon I of France. Brother & puppet ruler of Napoleon I of France. The lack of a king in French-occupied Spain creates instability in New Spain, and at the end of a turbulent year, the viceroy there is deposed under the authority of the Junta of Seville. However, the move is seen as the beginnings of independence for the colony. 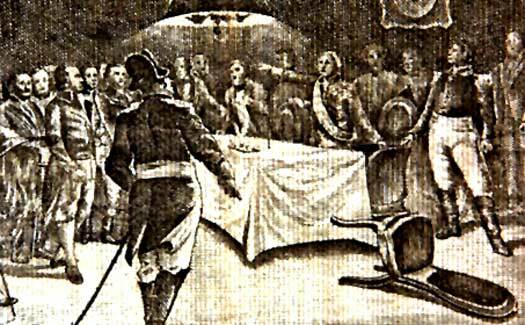 Open insurrection begins in 1810 in many of the Spanish colonies, with Peru standing as a centre for royalist opposition to the revolts. Incensed by Russia's refusal to join his blockade of Britain, Napoleon invades Russia with one of the largest armies Europe has ever seen. Frustrated by the Russian policy of using the vast space of the country to defeat him, he is forced to retreat to Germany. In early 1813, Europe's armies mobilise against him and French armies are pushed out of Spain by General Wellesley, and out of Germany by the allied armies. Restored by Britain (1814) & France (1823). Two years after Ferdinand signs away Oregon and Florida to the USA, but secures Texas for his colonies, Mexico and Guatemala achieve independence from Spain (1821). Following the loss of Hispaniola in 1822 and Peru in 1824, Ferdinand is left only with his territories in the Caribbean. Ferdinand is detained by rebels after refusing to adopt the new and liberal Spanish Constitution of 1812. It takes until 1822 for European states to react and in 1823, under general agreement by those states, French forces invade Spain to restore Ferdinand, supported by Charles Albert, the future king of Sardinia. The Battle of Trocadero sees the French attack a fort from the seaward side to secure access to Cadiz itself, which falls after a three week siege. Ferdinand is freed to take his revenge, executing around 30,000 people. Following the death of Ferdinand, his three year-old daughter is proclaimed queen regnant of Spain, but only because her father had previously helped to remove Bourbon-introduced Salic Law in favour of Spain's older succession law which allows women to rule. This leads to a number of pretenders who fight for the throne they believe is theirs by right, the first being Ferdinand's brother, Carlos. Thanks to him, his supporters and successors become known as the Carlists, but Spain's army successfully supports its queen. Dau. Proclaimed queen at the age of three. Deposed and exiled. Younger brother of Ferdinand. First Carlist pretender. Regent. Deposed by the military. Son of Charles (V). Died a sudden and unexplained death. The Second Carlist War is a short and minor civil war fought between the crown and Carlist forces, mostly in Catalonia, and is led by General Ramon Cabrera. The Spanish-Moroccan War, or African War, begins with a disagreement over the Spanish-controlled coastal city of Ceuta. The Moroccan forces accept defeat after the Battle of Tetuan. Brother. Abdicated Carlist claim in favour of his son. Died 1887. Spain recovers the eastern section of Hispaniola, now known as the Dominican Republic, when its leader elects to hand the territory back to the crown. 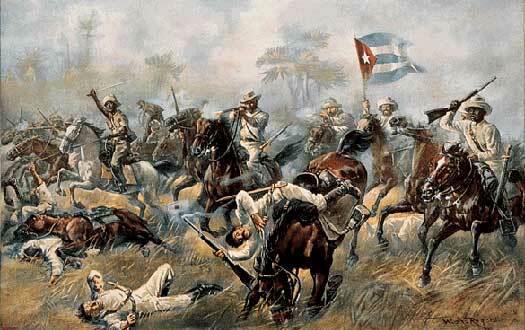 Opponents launch the Restoration War in 1863 and two years later Spain abandons the island. The death of Leopoldo O'Donnell, three times prime minister of Spain and former captain general of Cuba, leads to general unrest which triggers the Glorious Revolution. Queen Isabella is deposed and Spain is governed as a republic while the search for a new ruling house is undertaken. Isabella is exiled to France and is 'persuaded' to abdicate on 25 June 1870 in Paris (in favour of her son, Alfonso XII). This leads to the Franco-Prussian war when Napoleon III of France refuses to accept the possibility of the German Prince Leopold of Hohenzollern-Sigmaringen gaining the Spanish throne. On 3 November 1870, the search for a new monarch who will agree to abide by a constitution is concluded. A liberal Italian prince of the House of Savoy is selected. Son of John (III). Led the Third Carlist War in 1872. Following the Glorious Revolution of 1868, the search for a new king took until 1870, when the Italian prince of the House of Savoy and younger son of King Victor Emanuel II was selected. King Amadeo landed at Cartagena on 27 November 1870, swearing that he would uphold Spain's new constitution. He lasted two years, and his short reign led to the establishment of the first period of a republican government in the country. Son of Victor Emanuel, of the House of Savoy & king of Italy. Charles (VII) organises and leads the Third Carlist War, which is the last attempt to claim the throne away from what they see as the illegitimate rule of Queen Isabella and her descendants. The war continues into the Bourbon restoration which is brought about when Valencia is seized in the true king's name. Amadeo abdicates on 10 February following a dispute between him and the radical liberalist government. The following day the government declares the country to be a republic which is governed by parliament itself. The republic lasts twenty-three months and sees an astonishing procession of five presidents. On 3 January 1874, Manuel Pavia, captain general of Madrid, brings the republic to an end when he forces the formation of a new government. A short period of civil war between monarchist and republican forces lasts until a leading general declares for Alfonso to be king. The thought of handing the throne to Alfonso XII was dismissed in 1870 amid fears that he would be dominated by his mother, the former Bourbon Queen Isabella. After a two year period of republican government in the country, it was found that there was no political will to restore Isabella herself, but during the Third Carlist War, when Brigadier Martinez Campos took Valencia in the name of Alfonso XII, the president of the republican council resigned and power was transferred to Alfonso's representatives. While Alfonso's legal father was the Bourbon Francis of Assisi, there was a high level of suspicion that his real father was the captain of the royal guard or an army general. Francis has long been assumed to have been homosexual and Isabella was reputedly not above finding comfort elsewhere. Son. King from birth in 1886. Deposed, abdicated, died in 1941. Spain loses the Spanish-American War. With that it also loses much of the Spanish Caribbean, including Cuba, Puerto Rico, and the Spanish East Indies (including the Marianna Islands and the Philippines). Son of Charles (VII). Carlist pretender. Some support is given to monarchist Portuguese groups who aim to end their country's newfound republican status. In 1912, under the terms of the Treaty of Fez, Morocco becomes a French Protectorate, with a small protectorate of northern territories near the Straits of Gibraltar remaining under Spanish control. The First World War rages in Europe, but due to the king's family connections with both sides, as well as deep divisions in opinion being evident from amongst his subjects, Spain remains neutral for the duration of the conflict. The prime minister, Miguel Primo de Rivera, retires on 28 January 1930 after a seven year 'reign' of dictatorial governance. The reputation of Alfonso XIII, who had supported him, is fatally damaged by association. The Second Republic is proclaimed on 14 April 1931, and Alfonso is forced to flee the country. Spain becomes a republic again. Attempting to exploit the situation, the Carlist pretender, Jaime (III), attempts to rally supporters to his cause. Instead, he has two meetings with the deposed king in France, to an extent healing the breach between the two branches of the family, before suddenly dying. Although he had been king since the moment of his birth (following the early death of his father), Alfonso XIII became unpopular during his reign. The loss of the last of Spain's colonies in the New World and the dictatorship of Prime Minister Miguel Primo de Rivera in 1923-1930 ended his appeal with the people, and a republic was proclaimed on 14 April 1931. Unfortunately it was born in a period of worldwide economic depression and a high level of discontent with the old order of rule, and the situation in Spain soon descended into chaos, with assassinations and street fighting leading to a coup d'etat which eventually turned the country into a dictatorship. Uncle of Jaime (III). Carlist claimant to the throne. The republican Popular Front government defeats the right wing National Front in elections in 1936, forming the new government. In July, General Francisco Franco and a combination of monarchists and conservatives initiates a coup d'etat which triggers the Spanish Civil War. In September, Franco makes it clear that he will never accept Alfonso as king, while he also plays a skilful game of diplomacy with the various claimants to the Spanish throne, keeping them opposed to one another. With the death of the Carlist pretender and now claimant to the empty throne, Alfonso Carlos, most Carlist supporters support Javier of Bourbon-Parma of the House of Braganza, who had previously been named regent by Alfonso Carlos himself. However, there is a minority Carlist support base for Alfonso XIII, the exiled king. Alfonso Carlos' chosen successor. Died 7 May. Grandson of Charles (VII). Rival Carlist claimant. Three years of bitter fighting, in which Franco's nationalist forces have been decisively helped by the fascist governments of Germany and Italy, come to an end in Spain. The last republican forces surrender to Franco on 1 April 1939. 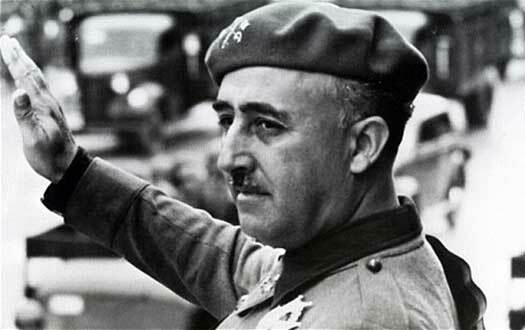 The country is governed under General Franco's military rule in which he manages to merge together the far right Falange party with the Carlist monarchist concerns, making the new single party the only legal one. Military dictator. 'Regent of the kingdom' from 1947. Son of Alfonso XIII and legitimate heir to the throne. After maintaining Spain's neutrality during the Second World War (apart from allowing troops to go to Germany to help in its fight against Russia), Franco proclaims Spain a monarchy, becoming de facto regent of the kingdom of Spain, although he also wears or uses many of the trappings of monarchy himself. With no particular wish to restore the king as yet, the throne is left vacant. Brother of Charles (VIII). Rival Carlist claimant. Morocco gains independence from France and Spain, although Spain hangs onto a few small enclaves on the North African coast (Spanish North Africa, or the 'places of sovereignty'). The most major of these are Ceuta and Melilla. Brother of Charles (IX). Rival Carlist claimant. In 1969, Franco designates Juan Carlos as his successor as king of Spain, which comes as a shock for the Carlists who have been hoping their own candidates would be preferred. Technically, Juan Carlos' father, John, count of Barcelona, has the prior claim to the throne. Modern Spain incorporates its traditional territory of the former kingdoms of Aragon, Castile, Navarre, and various smaller domains, covering all of Iberia except Portugal. It is neighboured to the north by France and Andorra, across the Mediterranean to the east by Corsica and Sardinia, to the south by Algeria and Morocco, and to the west by Portugal and the Atlantic Ocean. 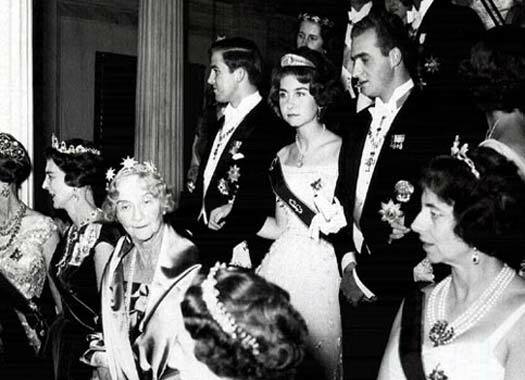 The Spanish monarchy was restored on 22 November 1975, two days after the death of Francisco Franco. Juan Carlos became Spain's first reigning monarch in thirty-nine years when he was designated king, although he had already governed as head of state for a short period in 1974, when Franco fell ill with Parkinson's Disease. His wife was Sophia, sister of the king of Greece. When Juan Carlos gained the throne, the Carlist claimant, Javier, abdicated his claim. However, this didn't stop his sons, Carlos Hugo and Sixtus Enrique, from both claiming the Carlist succession, with Carlos having the better claim due to his seniority. Approaching their claim from very different positions, neither amounted to a serious threat to the new legitimate king. Sixtus Enrique was of the opinion that his brother was ineligible to be the Carlist claimant due to his socialism, but accepted that his two sons should and will be the Carlist successors to both of them, should they accept traditional Carlist views. Francisco of the rival Carlist line also renounced his claim in 1975, but his son succeeded him, albeit with only minority support. Son of Juan III and grandson of Alfonso XIII. Born 5 Jan 1938. Son of Anton of Austria. Rival Carlist claimant. Son of Javier. Socialist Carlist pretender. Born 8 April 1930. Brother. Far right Carlist pretender. Born 22 July 1940. The son of Alfonso XIII, the last king of Spain before the Second Republic, John (III or IV) of Bourbon and Battenberg, renounces his claim to the throne in favour of his son, Juan Carlos, who has been king since 1975. The Spanish Constitution of 1978 confirms General Franco's choice of Juan Carlos as the king of Spain. Relinquishing absolute power, the king reigns but doesn't rule, leaving that to his elected parliament. The following year, in response to this, the Carlist pretender Charles (VIII) accepts Spanish citizenship from King Juan Carlos. However, he and his brother both continue to uphold Carlist claims to the throne, as does the Austrian rival, Domingo. There remains various levels of support for all of them, while some see Domingo as being ineligible due to having contracted an unequal marriage. As all of King Juan Carlos' children have done the same, the Carlist claim passes through an ever more obscure line of would-be pretenders. Grand Duke Jean's eldest son and heir, Henri marries Maria-Theresa Mestre in Luxembourg. In response, Carlos Hugo, duke of Parma rules that the marriage is unequal. In 1986 Jean issues a decree that renounces the titles of the House of Bourbon-Parma for himself and his family. Bishop Juan Marti Alanis of Urgel and President Francois Mitterrand of France are co-signatories of Andorra's new constitution. The principality finally becomes a parliamentary democracy. 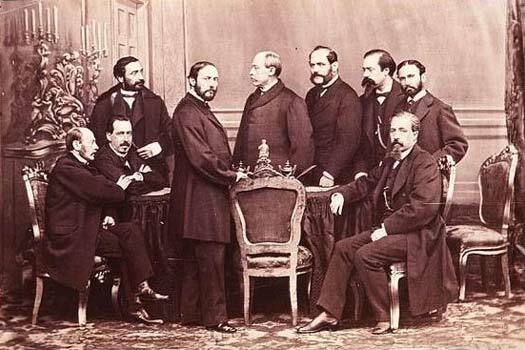 The new constitution retains the French and Spanish co-princes, albeit with reduced, and narrowly defined powers. Civil rights are greatly expanded to include the legalisation of political parties and trade unions, and provision is made for an independent judiciary. Son. Born 30 Jan 1968. On 2 June 2014 the abdication of King Juan Carlos is announced by the country's prime minister. Despite being seen as one of the world's most popular monarchs for much of his reign, the king's reputation had been tarnished by a long-running corruption investigation into his daughter and her husband, as well as by an ill-timed elephant hunting trip to Botswana during Spain's financial crisis. His son, crowned as Felipe VI, is the first 'King Philip of Spain' to ascend the throne since 1746. Dau. Born 30 Oct 2005. While Leonor is the eldest child of the crown prince, the Spanish Constitution of 1978 only allows her to remain the heir to the throne as long as she doesn't have any brothers, otherwise they will take precedence. Discussions in Spain suggest the possibility of amending the constitution to make Leonor the confirmed heir.